Couch, Kikuyu and Queensland Blue Couch can only tolerate 15% shade. But, if you mow it around 60-75mm high then it can handle 20-25% shade. Harden Park Lawns grows and supplies Qld Blue Couch. Zoysia can handle 55% shade in low traffic areas and 40% shade for high traffic areas when you maintain a mowing height of 60mm – this equates to 4-5 hours of sun per day. Harden Park Lawns grows and supplies Platinum Zoysia. Buffalo turf is the best variety of turf for shaded areas and requires at least 3 hours of direct sunlight each day which equates to 70% shade. It can handle a near zero level of sun during the cooler month as long as the sun returns to 3 hours for low traffic areas and 4 hours for moderate traffic areas. Again, mowing height can help. It can handle 50% shade in high traffic areas at normal mowing height, 60% shade in moderate traffic areas and 70% shade in low traffic areas if the mowing height is 60mm or more. Harden Park Lawns grows and supplies Sir Walter DNA Certified Buffalo, Tropical Turf (a Buffalo variety) and Tropical Turf Mix (80% Buffalo and 20% Couch). 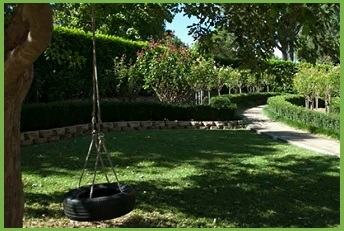 Overall, once you have the right variety of lawn for the shaded area it’s just a matter of good lawn care – prune overhanging branches to ensure good sunlight reaches the lawn, remove weeds as soon as they appear, water less frequently but more deeply, mow to the appropriate height, ensure any compacted soil is aerated, and fertilise on a regular basis. For more assistance on choosing the right lawn for shaded areas or how to care for lawn already installed in shaded areas in your backyard just contact the team at Harden Park Lawns.